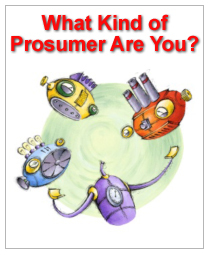 When Alvin Toffler coined the word ‘prosumer’ in his prophetic work ‘The Third Wave’ in 1980, there certainly wasn’t any effective means to communicate with mass consumers. So, once businesses noticed there were opportunities for ‘free lunch’, some took the advantage behind consumers’ back. This was accelerated by the advent of World Wide Web, and now it’s in full swing from governments telling us to fill any sorts of online application to grocery stores asking customers for self-checkout. It appears that some of them have managed to communicate with their customers while others even don’t have such an intention. In New Zealand examples, a supermarket Pak’n Save has successfully conveyed a message to and gained an approval from customers about why doing ‘self-s’. Massey university, on the other hand, has recently rolled out a new online enrollment system that forces students to submit and maintain our enrollment with more steps, explanation, declaration and so on. I haven’t found, to say the least, any enhanced benefits at all. And there was obviously no communication prior to the launch but the annual tuition increase, of course! I’m here at such a university trying to understand the concept of “Markets as Conversation” –The Cluetrain Manifesto. Ironic enough? and promoted the use of ‘produser’, it’s a bit misleading and we don’t need to add one to oceans of new jargons. Of course, it’s not grounded on the explosion in social media; however, as seen in the definition of The Third Wave – ‘Information Age’, the term was expected to cover such activities as creating digital contents. Besides, Toffler himself expanded the concept and proved its validity in Revolutionary Wealth (2006) mentioning those the self-motivated creative originators such as bloggers. Prosumerism is rather becoming more relevant due to social media, with which we continuously interact, produce & consume. It is not at all only among traditional consumers, amateurs or hobbyists; but also happening between corporates and their markets. In Don Tapscott’s words, technology and the business environment have finally caught up with predetermined ‘The New Organization’ era proposed by Peter Drucker. In which talents are actively exchanged and innovations are made happen. While Drucker’s point might have been restricted to the exchange between only corporates, there’s no point in excluding hidden talents outside thanks to social media and ‘porous membrane’ again. Who knows those outside corporate walls are more gifted and passionate about their products? This is the reason I argued incorporating Twitter straightaway into business is the most effective way of fully taking advantage of this opportunity and promoting these exchanges & innovations. As a number of thinkers pointed out, the boundary between professional and amateur practices has become really blurred; hence, many of us are no longer pure consumers. It’s finally time for prosumerism to come true and be fully understood & utilized in order to push the human race forward. Prosumerism is one of the simplest way to see the world that is being drastically changed by social media.